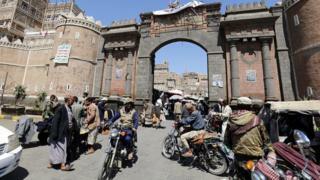 A fragile ceasefire is reported to be holding in Yemen amid the latest effort to end more than 18 months of fighting in the war-ravaged country. The UN-backed truce is intended to last at least three days, though there have been reports of sporadic clashes. A Saudi-led coalition which backs Yemen's exiled president, and Houthi rebels which ousted him, have said they will retaliate if attacked. The war has killed nearly 7,000 people, mostly civilians, the UN says. The coalition has been fighting rebels and their allies since March 2015, when a Saudi-led air campaign began. Five previous ceasefires broke down within a short time. The announcement of the ceasefire follows international condemnation over the deaths of 140 people in a Saudi airstrike which hit a funeral gathering in Sanaa. Saudi officials said they targeted the wrong site by mistake due to "bad information". The conflict and a blockade imposed by the Saudi-led coalition have triggered a humanitarian disaster, leaving millions of people homeless and hungry and 80% of the population in need of aid. The UN-brokered ceasefire, which began on Wednesday at just before midnight local time, is intended as a way to get aid to civilians.